Specially designed and contoured to fit the JANE TRANSPORTER & TRANSPORTER 2 carry cots. This mattress is light, breathable and fits snugly inside your Transporter 2 to provide a soft comfortable place for your baby to sleep. Suitable for overnight sleeping or as often as required. 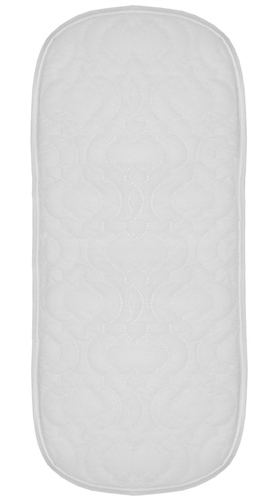 Has a removable washable cover that's made from an especially breathable quilted polyester material. Warning: Only use this mattress when using the Transporter 2 as a carrycot for sleeping and not when using the product in your car as a car seat or lie flat car seat. We have a transporter 2 and want to buy one of these for occasional overnight sleeping. Does it fit on top of the existing mattress/padding in the transporter 2? If so, how do I remove the harness so baby isn't sleeping on a lumpy base? Thanks. Jane UK Replies: Hi Danni, You can use this additional Safety Mattress only when you using the Transporter2 in the house or as a pram, and not when using the Transporter2 as a car auto car seat. This mattress goes on top of the existing mattress. The harness doesn't need to be removed, just unbuckle it and place each fitting of the buckle out of the centre of the Transporter2. This additional Safety Mattress is padded enough so your baby wont feel the harness, and because your baby is not harnessed this is perfect of overnight sleeping, just like a traditional Moses basket or crib. Please note however, because the harness doesn't go through this additional Safety Mattress, you must use the original mattress and harness your baby when using the Transporter2 as a car cot in the car. Hope this helps. Jane UK Replies: Good morning Leigh, Thanks for getting in touch, hopefully I can help! Yes, the new mattress is a perfect fit for all transporter models. The previous mattress was designed to fit both the Matrix Light and the Transporter I. Now Jane have released a mattress for each separately so each is a perfect fit, rather than the old one which was universal. So you will find the new one is actually better than the fit on the old one! I hope that helps!